This year marks the anniversary of numerous influential U.S. Supreme Court decisions. On March 3, it was 100 years since the court established the “clear and present danger” test for protected speech. In February, we celebrated the 50th anniversary of Tinker v. Des Moines Independent Community School District. Thirty years ago in June 1989, the court ruled that burning a flag is protected expressive conduct. In honor of the occasion, we created a gallery featuring nine monumental Supreme Court cases on free speech and free press, all from years ending in the number nine—and another focusing on 12 free speech and free press milestones from the Supreme Court, moments in legal history that defined our understanding of these rights. As you celebrate the rule of law May 1, ponder this, as well: What could 2019 bring for free speech and free press? Learn more about how the Supreme Court has ruled on First Amendment over time in the gallery below. And keep an eye out for the second gallery later this month. If you want to read more about the First Amendment, check out these ABA Journal stories, as well as our April cover feature and this sidebar about Law Day 2019. This year is the anniversary of countless influential U.S. Supreme Court decisions. March 3 marked 100 years since the court established the clear and present danger test for protected speech. In February, we celebrated the 50th anniversary of Tinker v. Des Moines Independent Community School District. In June 30 years ago, the court ruled that burning a flag is protected expressive conduct. For whatever reason, years ending in nine correlate to landmark free speech and free press decisions. 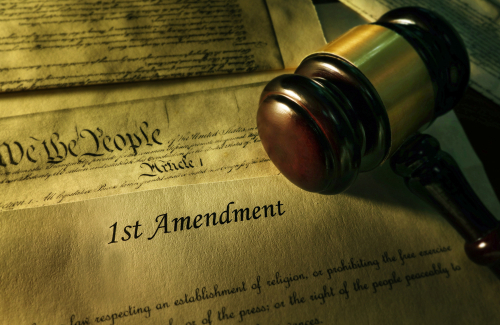 Now it’s 2019, the perfect year for the Law Day theme “Free Speech, Free Press, Free Society.” In honor of the occasion, we created a gallery of nine monumental Supreme Court cases on free speech and free press—all from years ending in the number nine. As you celebrate the rule of law May 1, ponder this, as well: What could 2019 bring for free speech and free press?